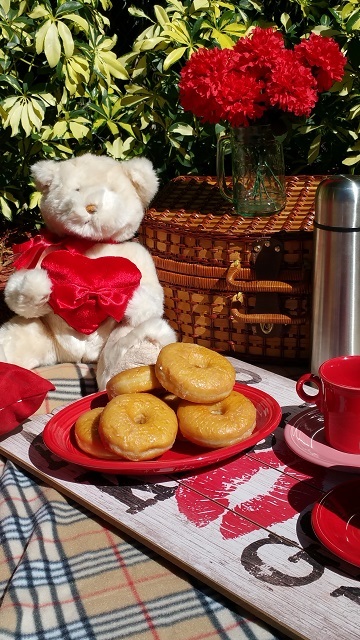 Valentine picnic with hot chocolate, donuts and a valentine bear. 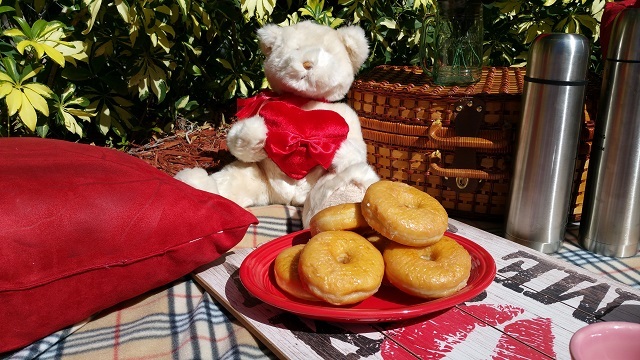 Valentine Bear, Hot Chocolate & Donuts! This morning, we awoke to 45 degree weather! Really cold for our neck of the woods! I woke up as the sun was waking up Florida! Most of the time, it’s still dark in the house when I hop out of bed. By the time I grab my hot tea and curl up in a cozy chair, the sky is changing from first light to brilliant colors. It’s my own personal, 3D effect. The light dances off the trees and in through the windows, streaming a kaleidoscope of colors. And who knows what lies ahead? Like the Captain offering to run to the donut shop. Donuts are not part of our regular diet…but every now and then…we just gotta have one…or two…or three. Glazed Donuts are my favorite, although there are great tasting donuts filled with apples and cinnamon, or frosted with a soft, creamy, maple frosting. This morning, I could feel the cold and couldn’t help but think it was a donut kind of day. I don’t really need a reason to eat donuts. While the Captain was off on his quest for donuts, I couldn’t help but think of a cozy donut picnic with hot chocolate! We don’t always have cooler weather requiring blankets and steaming cups of hot chocolate! So, I grabbed the “picnic” stuff and headed out the door. A blanket, a couple pillows to lean on, even a small mason jar of red, silk carnations that was sitting on the living room end table! 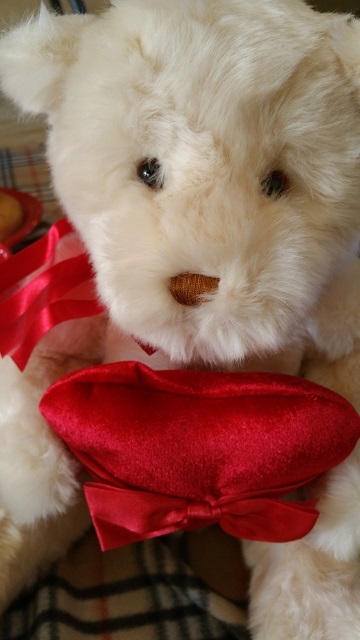 I also grabbed the valentine bear that the Captain had given me a couple years ago….. everything a spur of the moment thing. That is the best, isn’t it? So I took my everyday dishes, picking the red and pink Fiesta dishes from the multi-colored stack of plates and headed for the Secret Garden to wait for the Captain to return with the donuts. By now, the sun is sending down warm rays of sunshine as the temperature begins to climb. Supposed to get up to 73 by mid-day. Do you like to picnic? You can plan a picnic with as little or as much as you like….and you can do it in all kinds of weather. We haven’t really had a picnic in the snow, unless you count the time we were in Colorado camping and it snowed several inches. We were bundled up in very warm coats and hats…. holding steaming cups of coffee as we watched the cute little chipmunks scamper about. A picnic can be had in all kinds of weather. Enjoy your week my dear friends! Have you had a special picnic time that you would like to share? We had wonderful picnics when I was a child, Kari. You are spoiling your Captain. Wink! I know he spoils you, too. Picnics are always fun aren’t they? Mouth watering, glazed are my favs too. Comfort tastes seem to be what I crave the most….and a warm, soft glazed donut is at the top of the list. 🙂 Thanks for stopping by. Hugs always to you, my friend. What a perfect and spontaneous picnic! Ooh, hot chocolate and donuts, what special treats! Happy Thursday, Kari! Thank you dear friend….and Happy Thursday to you too! Now that’s my kind of picnic! Yum in the tum! 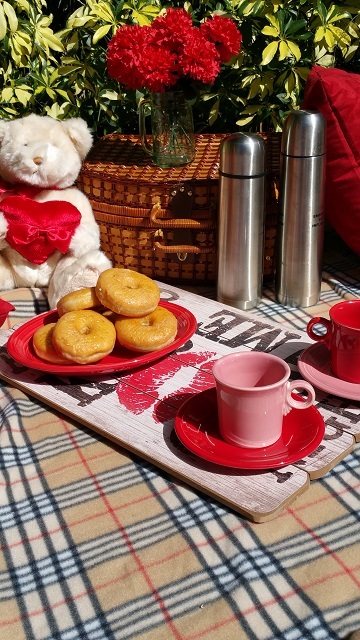 A donut picnic on a cold morning sounds very cozy indeed! And those donuts were like a melt in your mouth donut…perhaps you have heard of Krispy Kream? LOL Like who hasn’t? Kari, this is awesome! 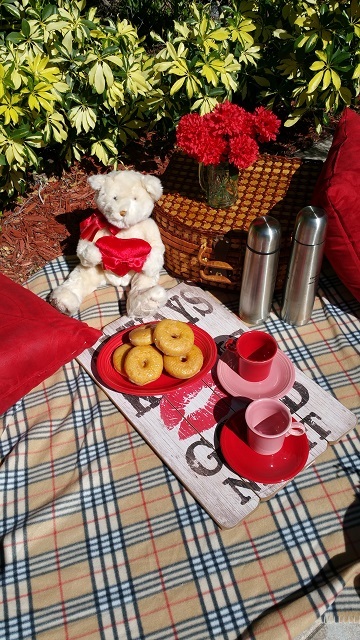 A picnic, hot chocolate and donuts…PERFECT!! Love and hugs! Thanks for sharing at Homestyle Gathering, Kari! Hugs! Happy to do so Julie…have a great week end, my friend. What a fun impromptu little picnic! Seems like a good idea to me! We have breakfast out on the porch most mornings, except lately it has been a little tool cool for that for me! BUT, I am loving the cooler weather! Isn’t that the truth….is was 41 degrees this morning. Brrrrrr! I love your teddy bear picnic and now I want donuts.